Merry Christmas from Sage to Meadow! Rain fell and our reservoir will last (current analysis) until February 15. Enough water fills the cow tank so ducks feed and socialize. 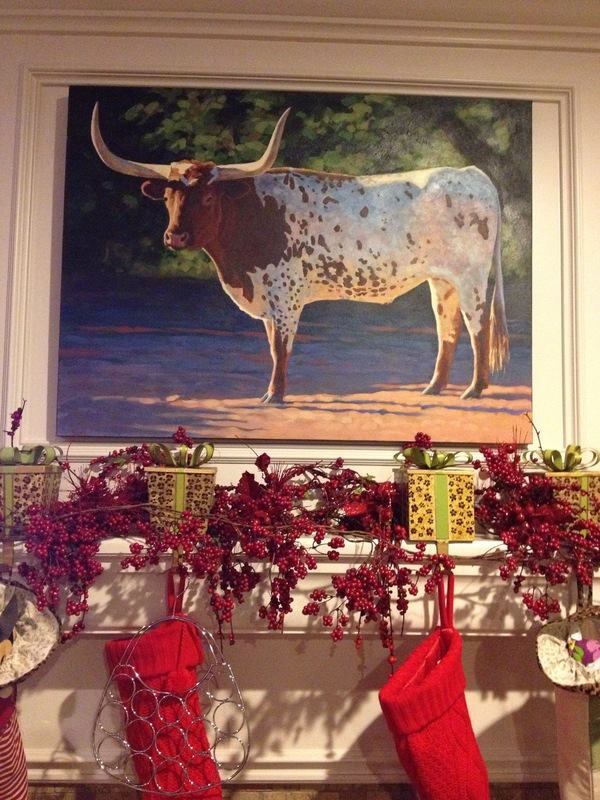 The longhorn painting hangs above my daughter’s fireplace in Lubbock, Texas. In my continuing project to photograph all different species of flowering plants on Flying Hat Ranchito during 2012-2013, I give you seven more Flowers of Flying Hat (32-38). Please correct my identification if I make an error, for I want my cataloging to be accurate. As the Tall Coneflower matures, it loses the green-gray cone, becoming brown. These are immature, but mature Tall Coneflowers erupt throughout the ranchito. These immature coneflowers suddenly sprang up after the last rain along a terracing ditch for stock ponds. The large spindle-like purple flowers in the background are horse mint, previously photographed. This odd-named plant is a host to several larval: Phaon Crescentspot, Buckeye, and White Peacock butterflies. I find butterflies and bees abounding on its blossoms. The sprawl is located in front of my C&C livestock trailer and my Big Texas flatbed. It is flooded and dried by the sun, time and time again, and still remains robust and flowering. Frankly, I nearly passed over the blossoms for they are quite small — about 1/4 inch across –, but decided to go back this morning and photograph. Upon looking up its characteristics, I am impressed with its connections to bees, butterflies and larvae. I wish I knew how Frogfruit got its name. And it is Turkey Tangle Fogfruit, not Frogfruit, in case you are interested. Fogfruit, Frogfruit — what nomenclature our ancestors tagged on flora. I can’t wait for someone to ask me down at the barn, What kind of plant is that? My answer, Why don’t you know? Everyone knows that’s…. If I have been stuck by this cactus once, then it is for sure at least a hundred times more over the years. I may have been bucked by a horse long ago into a bunch of these Christmas cacti. I have eaten the fruit carefully. I went down to the Grove this morning to see if the Wine Cups blossom in cooler temperatures — 70 F. The Wine Cups were gone, but these Goldenmane Tickseed had sprung up about the area where the Wine Cups had erupted. Fair enough, I think, for the soil is rich, the shade is cool by the creek, and there is room for several blossoming plants. Bipedalism came first, then the large brain among the history of primates. The upright stance allowed man to scan the savannah, edges of forest and plains, or wherever he had wandered for food and predators. I haven’t posted since December 27, 2011, mainly because I have had eye problems (really, only the left eye) since December 25th, Christmas morning, and a “Ho, ho, ho,” Christmas gift I desire to return, but can’t! I woke up that morning with blurred vision caused by a macular hole in my left eye. This last Tuesday, January 10th, I received a vitrectomy at Arlington Day Surgery Center, under the skilled hands of Dr. David Callanan (Dr. Wu administered the pharmacological agents — much appreciated). I may still be bipedal, but I have assumed the position of a face-down recovery period lasting five days or more so that I neither can scan the savannah nor see the quacking ducks on my pond. I cannot have any hard spirits during my ten-day recovery, but that is not as painful as it may seem to some. I have this nature blog and like to go out into the field, but the only nature I see are house plants, two dogs and trees outside my living room window. I take a new interest in bugs that infrequently cross the floor. I took a picture with my iPhone immediately after surgery and this is what I look like. I spend most of my days face-down in a specially-designed “chair” and a bedside rest for my face that is like those contraptions in massage parlors for your head as you get your massage. Dr. Callanan predicts a 90-95% recovery of vision in my left eye with another operation for cataracts in about a year (cataracts — Nile River, Egypt). So, I will not be hiking the grove or taking photos of juniper any time soon. Medical technology and habitat adaptations, however, have come a long way since primates first scanned the savannah. I’m in a safe wikiup, been worked on by medicine men and women, have taken drugs and have nature outside my window. My hearing and tactile senses are sharpened. I listen for the Sandhill Crane that may fly overhead. I brush my canine that barks at strange sounds at the edges of camp. Although I question that human society has progressed, today with the skills brought to bear in my life I think in some areas we have progressed. Juniper in Flying Hat Ranchito grove, often referred to as cedar (J. Matthews, 2011). All of that being said, the cedar or juniper holds personal value for me beyond the descriptions, quotes and links I attach in this post. Of all the flora about me as I grew up and the plants about me now, the juniper radiates scent and memories, even beyond the majestic pecan in my far pasture. I burned juniper in a Folger’s coffee can to sweeten the air at campsites and even in my apartment from time to time, placing the coffee can at the edge of the hearth. I have taken cedar bark and twisted it into fine pieces and lit a single match to start a campfire, and I have carried cedar tinder in my backpack to start fire along the trail. I cut cedar staves and posts one Christmas vacation to earn extra money and to say, I once worked as a cedar chopper. Green juniper groves along the Colorado River near Bend, Texas, contrasted with bleached white-gray rock outcroppings, and I found old campsites of roundups in pastures about the river, the blackened rock, not the red, holding the remains of cedar fires. My grandmother once pointed out a cow camp firepit near the Colorado that she had cooked for the crew and her husband-cowboy Jake, before his accident on the horse Hell’s Canyon. I have camped near cedar breaks many times, but the one time I remember was on the Zuni Reservation, out in the middle of the reservation, by myself with junipers and coyotes through the night. I built a small fire of cedar and munched on a juniper berry for its bitter effect. I had sped to the reservation from Grants, New Mexico, and hastily set up camp, sleeping in my bedroll beside the fire the night through. I was seeking a medicine man, but he never found my camp. More often than not at Christmas time, my family cut a juniper tree from the ranch to place in the living room. The tree may have been as short as three feet, at other times, five-feet tall. I loved the aroma of the juniper as it filled the house for Christmas. Tinsel drooped from the branches with those bubbly lights all aglow. Near Abilene, on the road to Coleman, there is a park on the east side of the highway at Buffalo Gap, a broad cut in the hills that buffalo and migrants used to go into southwest Texas from the High Plains and Caprock. The park has a large grove of junipers that have trunks three to five feet in diameter. I have rested there many times and note the broad-deep shade the junipers provide in the Summer and windbreak during Winter. From the Juniper Park — as I have taken to call it — one can see into Buffalo Gap and off in the distance the plains to the north. This Juniper Park has been a lookout, a redoubt of some sort, for a long, long time. I think I stopped there one time when I was traveling to Brownwood to take care of my aging mother, or it may have been another time, and I rolled the windows down to smell the juniper and place my hand on the fertile greenery I had known all my life, or that other day anew in late Spring. I thought then, as I do now, that I will remember this day for as long as I live, for although my mother lay dying and I was teaching in a foreign land, the evergreen of juniper and its effect transcended my sorrow and sense of alienation from this world. I have found home and peace and love beneath junipers for all my seasons. To me, its fruit is never bitter. Some juniper trees are misleadingly given the common name “cedar,” including Juniperus virginiana, the “red cedar” that is used widely in cedar drawers. True cedars are those tree species in the genus Cedrus, family Pinaceae. In Morocco, the tar (gitran) of the arar tree (Juniperus phoenicea) is applied in dotted patterns on bisque drinking cups. Gitran makes the water more fragrant and is said to be good for the teeth. American Indians have used juniper to treat diabetes; such treatments by the Navajo, for example, are under clinical study. Clinical studies have shown that treatment with juniper may retard the development of streptozotocin diabetes in mice. Native Americans also used juniper berries as a female contraceptive. The 17th Century herbalistphysicianNicholas Culpeper recommended the ripened berries for conditions such as asthma and sciatica, as well as to speed childbirth. “Juniper,” Wikipedia, accessed December 25, 2011.
juniper, any of about 60 to 70 species of aromatic evergreen trees or shrubs constituting the genus Juniperus of the cypress family (Cupressaceae), distributed throughout the Northern Hemisphere. The juvenile leaves of a juniperare needlelike. Mature leaves are awl-shaped, spreading, and arranged in pairs or in whorls of three. Some species have small, scalelike leaves, often bearing an oil gland, which are pressed closely to the rounded or four-angled branchlets. Male and female reproductive structures usually are borne on separate plants. The reddish brown or bluish cones are fleshy and berrylike and often have a grayish, waxy covering. They mature in 1 to 3 seasons and contain 1 to 12 seeds, usually 3. Common juniper (J. communis), a sprawling shrub, is widely distributed on rocky soils throughout the Northern Hemisphere. Many ornamental cultivars have been developed. The berrylike megastrobilus of this species is used to flavour foods and alcoholic beverages, particularly gin, which is named after Juniperus through the French genièvre. Juniper “berries” have a fragrant, spicy aroma and a slightly bittersweet flavour. Used with venison, they remove the gamey taste. They are also used to season sauces and stuffings, in pickling meats, and to flavour liqueurs and bitters. An important ornamental and timber tree of eastern North America is the eastern red cedar (J. virginiana), whose fragrant wood is made into cabinets, fence posts, and pencils. This species is an invader of glades, pastures, prairies, and other open grassy areas in parts of its range; thus, it is considered a troublesome weed by some botanists and land managers. The savin (J. sabina) of central Europe, Chinese juniper (J. chinensis) of eastern Asia, and creeping juniper (J. horizontalis) of eastern North America are other popular ornamental species with many horticultural varieties. The wood of incense, or Spanish, juniper (J. thurifera), of Spain and Portugal, and of Phoenician juniper (J. phoenicea) of the Mediterranean region sometimes is burned as incense. Oil of juniper, distilled from the wood and leaves of several species, is used in perfumes and in medicines such as diuretics. Galls produced by junipers as a reaction to fungal infection are known as cedar apples. This fungus, cedar apple rust, completes its life cycle on members of the apple subfamily of the flowering plant family Rosaceae, which contains numerous species of trees and shrubs commercially valuable as fruit and ornamental plants. The growth of junipers around apple orchards and plantings of related genera is thus discouraged to avoid disfigurement or loss of these important cultivated plants. Encyclopædia Britannica Online, s. v. “juniper,” accessed December 25, 2011, http://www.britannica.com/EBchecked/topic/308301/juniper. 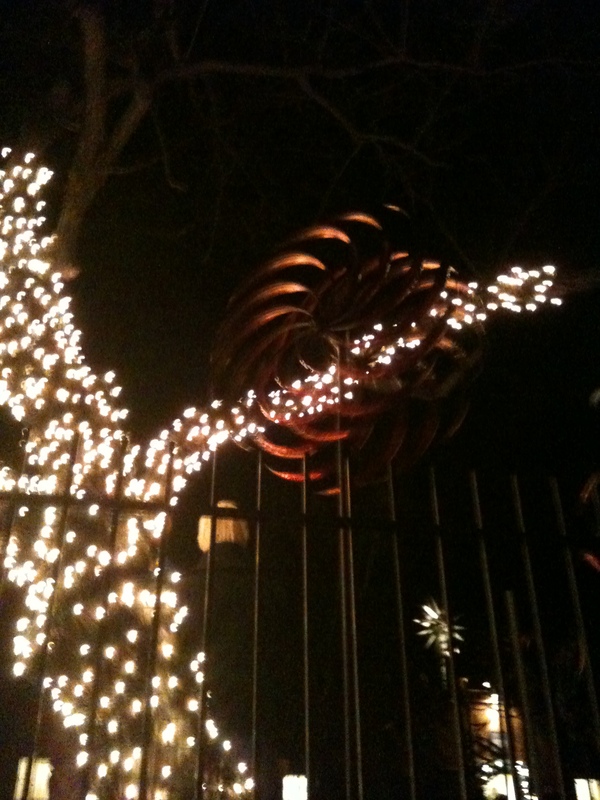 Electric lantern in central Texas with characteristic star, December 24, 2011. I wish you a Merry Christmas and Happy New Year! In the words of Abraham Lincoln, A fellow is about as happy as he makes up his mind to be. So, in the spirit of a great president who faced reality head-on, let us make up our minds a few times during the day to be merry and happy. I would be a lot happier if I didn’t have to hear Alvin and the Chipmunks sing Christmas songs, but it is hard to avoid if one goes into the city malls. Yet, to stay out of the malls means I might not run into my favorite seasonal character, Clark Griswold. Play ball! My Uncle Floyd and Aunt Lennie had a ranch at Cherokee, near Fredericksburg. I spent summers and holidays with Floyd and Lennie as a boy and teenager. My Aunt Lennie prepared chicken-fried steak that was actually a recipe for wienerschnitzel (lightly breaded veal steaks) and serve beets that were purple and sweet and icebox cold. My cousin, Allan, and I literally begged her to prepare chicken-fried steak. Little did I know then that she obtained her country cuisine largely from the Fredericksberg German culture. Christmas variety cookies at Fredericksburg Bakery, December 24, 2011. The Fredericksburg Bakery has been producing cookies and breads since 1917. Here is Dooley's Red Angus bull, my neighbor to the west (December 22, 2011). There is nothing wrong with the drooling Red Angus. He has been feasting on shortgrasses and hay, perhaps a few Christmas cookies. He’s a very gentle fellow and will amble away when you approach him. The Red Angus breed is noted for its weight-gaining ability. I have considered purchasing some. Red berries beside Highway 16 near Llano, Texas (December 23, 2011). These berries look good enough to eat, but don’t! If you see berries or fruits that are red and you don’t know the variety, don’t eat the red! These berries are not to be mixed into any Christmas recipe for cookies or breads. Please refer to your favorite cookbook for ingredients in your cookies. Texas boots on the last shopping day before Christmas (Fredericksburg, Texas, December 24, 2011). Cottontail rabbit eating spilled grain, December 22, 2011. I like this pre-Christmas Eve image. I had fed Star before dark and left the light on in the barn and stalls. When I went back down to turn off the lights, I saw this cottontail beneath Star’s feed and hay bin, delicately picking up stray nuggets of Horseman’s Choice 12% feed. I watched the rabbit for five minutes and snapped several shots with my iPhone, the one I include here being the best in low light. The rabbit probably favors a sweeter fare, like the Purina sweet feed for performance horses. Heron and squirrel along Baron's Creek in Fredericksburg, Texas, December 24, 2011. Baron’s Creek runs through Fredericksburg, Texas. I walked along the creek yesterday and today. This afternoon I spotted a heron in the water and framed the heron with the pecan tree on the left of the shot. When I looked at the results, I saw a squirrel in the tree. Do you see the squirrel? The squirrel had been gathering pecans, the heron waiting for the stray frog or fish. Tomorrow is Christmas Day. I hope to have another post about rural and town life in central Texas as well as the flora and fauna. Be sure to note my attention to juniper on Christmas Day. In central Texas, for as long as I can remember, pecans and turkeys have been a mainstay harvest source for my family clan: Morris, Parks, McRorey, Millican, Gray, Hollingshead. The Millican family business, stretching back to the nineteenth century, provided pecans for Queen Victoria and Alfred Lord Tennyson. The queen and Lord Tennyson were an integral part of the customer base for many years. My grandfather and grandmother took long bamboo poles and thrashed pecans along the Colorado and San Saba Rivers. On one occasion my grandfather lost his high school ring while thrashing and never found it. Someone will unearth it one day and see the graduation date at about 1917-1918, and think it unfortunate, yet quaint, the ring was lost. Before mechanical pecan shellers, my step-father and uncles about Thanksgiving and Christmas had stained fingers, like charred wood, from cracking and peeling pecans. In older years, a package of shelled pecans was always included with Christmas gifts and the nuts were minced upon for days thereafter. As I put a pecan in my mouth, I reflected upon the labor tended, my step-father cracking pecans in front of the radio or television in the evenings. I knew hard shell from soft shell pecans and sought the soft shell to crack — didn’t we all? The McRorey family — Floyd, Lennie, John R. and Joycelyn — raised turkeys for the Thanksgiving table on a grand scale with thousands fed and sped to market before the holidays. The turkey business was good for the McRoreys and when I stayed with them I drove the tractor as grain was unloaded in the feed bins. I was not the best of drivers, but I meant well. I learned much from my Uncle Floyd. My mother hunted wild turkey. On one occasion in Brown County (Brownwood, Texas, the county seat), she bagged the first turkey of the season. With a .22 caliber rifle she took her kill that season. She arose before daylight in the morning and placed herself behind a hunter’s blind on my uncle’s ranch near Brookesmith, along the creek, and waited patiently for the flock. Ofttimes, she merely watched the wildlife, counting the flock or observing deer in the pasture. For many years after she won the first-turkey-taken prize, as I accompanied her on errands around town, she was asked: Are you going to get the first turkey this year, Gywn? What rifle do shoot turkey with? Where do you hunt? I am one and two generations removed from a family clan that thrashed pecans, raised turkeys and lived off the produce of the soil, harvesting and consuming nature’s fecundity. I have only lightly touched those activities, but I am aware, deeply so, that when I eat pecan pie today I see the bamboo poles of thrashing in the rafters of the barn, and when I see the breast meat of turkey upon my plate I hear the gobble-gobble of Uncle Floyd’s turkeys along the Cherokee Creek in San Saba County. I am truly thankful for for the produce of the soil and the hands that have tended the harvest and taught me lessons about nature and all that dwells therein. Lights wrapped around tree with mobile art piece. Christmas in Santa Fe includes the traditional farolito stroll after dark along Canyon Road, the artistic thoroughfare that delights the eye. 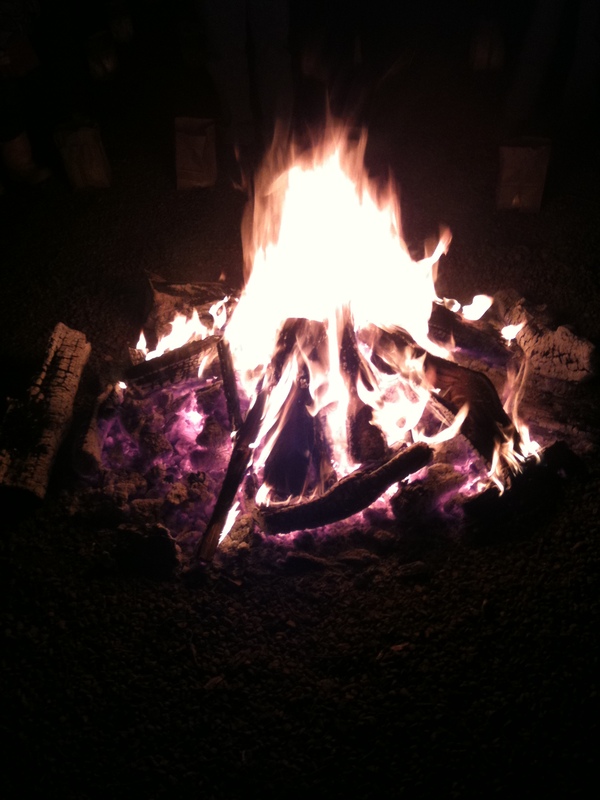 The luminaria is the wood fire. 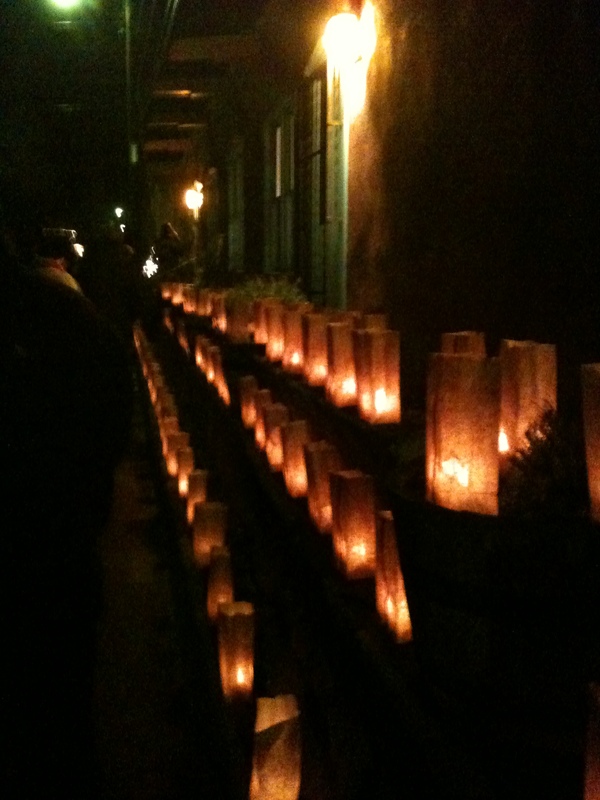 Farolitos are candles within paper sacks that light up the edges of sidewalks and walls along Canyon Road. For up-to-date information, consult the Santa Fe New Mexican newspaper’s Christmas Day edition. New Mexican Christmas celebrations rival Italy and Germany. Alessio Franceschetti, a very good friend of mine, sent me a montage of Christmas scenes in Italy. Do look at it: Natale in Italia 2010. This montage is moving and beautiful. Thank you, Alessio. 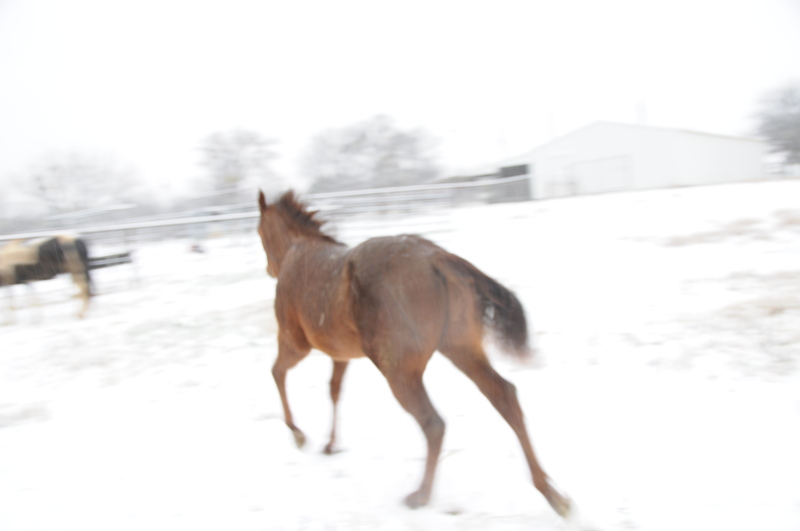 Shiney galloping to the corral during winter. No fear of the sun disappearing here. The sun in the northern hemisphere is at its lowest points this time of the year. I do not think ancient and prehistoric people feared the sun would continue to sink towards the south and disappear forever — at least in southern latitudes of the northern hemisphere. There was and is sufficient overlap of folk knowledge and tribal elder history to instruct the young and anxious that nature’s cycle continues her circle of cold to warm to hot, hot to warm to cold. Christmas Eve and Day are here. I wish each of you a Merry Christmas and Happy New Year! Lilly, our oldest mare, is holding her own at 25 years of age. She moves between the Well House Corral and the pasture, indicating a good level of energy and health. Her feed consists of all the alfalfa she wants, Equine Senior Purina grain and 1 – 2 grams of bute (painkiller for horses) a day. To husband animals rewards the steward: nickers and whinnies of recognition and impatience, warmth of animal in cold weather, riding for fun (both rider and horse can enjoy if accomplished properly) and work, and the sheer companionship and friendship of the horse. One of my pleasures of having horses is hiking in the woods and having Star follow me like a hiking friend. Star will go up and down creek bank, push aside brush to continue the hike and rest with me beside a fallen log. If I wish to walk alone, I have to close the gate to the woods. Most of the time, I want him with me. Star is confined to the first corral. He is overweight and feed intake must be limited. He has all the coastal bermuda hay he can eat and some painkiller for his front legs. His confinement lasts one week. I have had to separate him from Lilly since she has alfalfa, he must have coastal. Star is not pleased, but he adjusts. December 16, 2010, 7:05 a.m. Within the last two weeks I have noted birds about the barn and stables sing profusely only in the morning during the winter and are relatively quiet for the rest of the day. I have not spent the day about the barn and stables to confirm unequivocally this observation (I’ll probably regret having brought this up in the first place), but it seems a sound observation. During the day when I do chores and in the evening when I feed the horses and spend a hour or so in the barn area, I hear no birds or few birds. In the morning, birds chatter and tweet, but do not break into long melodious fugues. Our small ranch is located in North Erath County, Texas, Lat 32.43 N, Long -98.36 W, elev. 1,086 ft. Turkey Creek Quad. Mesquite trees, live oak trees, elm and underbrush comprise the habitat for birds. Among singing birds I see in the morning are redbird (just tweets), titmouse, chickadee, wrentit, wren, red-headed woodpecker, white-crowned sparrow, house sparrow, dove and a couple of other species I have yet to identify. They browse in trees, on the ground and in the underbrush. If I remain motionless in the corral after disturbing them, they resume their chattering and calls in a few minutes. When the sun reaches a point in the sky at approximately 10:00 a.m. or so, songs and calls diminish. I see birds for the remainder of the day, though not quite as frequent as the first two or three hours in the morning. I hear during the day the quacks of ducks on stock ponds and crows on the fly. I have returned from the barn and stable area and this post is taking a curious turn. A cold front moved in last night and the temperature is 40 deg. F. The sun is not shining and clouds completely obscure the sky. On point, birds are quiet, not even a peep, casting a different observation and bringing to light variables I had not considered: temperature, sunshine, clouds. With the temperature in the 40s and no sunshine, I hear no birds. This post was published Christmas 2009. I have added some photographs to the original for this 2010 Christmas. I find “Christmas Eve music in Old California” poignant with the cultural interaction. Christmas in California before the Americans came [1840s] was a season when all the grown people had as much fun as the children do now. And the children had so much fun that they never got over it and ever after loved play and presents more than work and hard bargaining…. One Christmas Eve, I remember best, there was a full moon. Over all the ground there was a glittering frost, just enough to whiten everything, yet not enough to even nip the orange trees which at this season of the year hang full of fruit and blossom both…. We had much music–guitars of the Mexican and Spanish type, made with twelve strings of wire, and mandolins. After supper there was dancing in the patio, coffee and cigaritos on the veranda, and singing everywhere. Someone said it was a beautiful night for a horseback ride over the valley to the Mission Santa Clara. The horses in the corral were soon saddled. There were twenty-five or thirty of us young men and women. Our horses were the best of the big herds that were attached to every rancho….The saddles, bridles and spurs were heavily covered with silver bullion ornaments, as in those times we put silver on our horses instead of on our dining tables; for Spaniards…live on horseback, and they eat but to live, instead of living to eat. Riding out of the patio gate it was like a scene from the time of the Moors in Spain. As our horses snorted in the cold air they spun the rollers in their bits, making music that only the Spanish horse knows . José Ramon Pico, “Before the Gringo Came,” San Francisco Call, December 1899. From Sam Travers, Christmas in the Old West: A Historical Scrapbook, pp. 171-174. Mission Santa Clara Asís established in 1777, was located a few miles south of San Francisco. This mission and adjacent Indian pueblo eventually grew into Santa Clara and San Jose. The mission is now located on the campus of Santa Clara University. Sweet Hija (Spanish for “daughter”), my black mare, has King Ranch breeding. 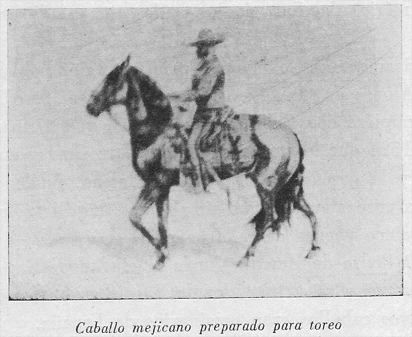 Even today, King Ranch provides ranch horses for Mexican ranches. Of all my horses, Sweet Hija is the fastest and most energetic. After saddling Hija, I must run her about the round pen to work off her energy before she is ridden. She is the most alert and sensitive to her surroundings, spotting deer a half a mile away. I have to use binoculars to see what she sees.